Congratulations! You’re engaged! You’re about to embark on the exciting journey of marriage. Now you get to plan your beautiful wedding day! Creating an event planning wedding checklist will help you feel more organized and stay on course. Today we’ve written a blog detailing some of the critical event planning steps on the way to your wedding day. Read on to discover the ultimate wedding checklist! This is an essential part of the process that will help guide many of your other decisions. With so many things going on during your wedding planning, it can be easy to get off track with your budget, and you don’t want your wedding to become a financial burden. To avoid that, come up with a detailed budget and make sure you stick to it! This is a tricky and lengthy process. It’s hard to have to say no, but you can only invite a certain number of people to the event. If you have a large budget, you might be able to fit everyone in. However, if your budget is tight, you’ll have to make some tough decisions. This is a fun part of planning! You get to choose which dear friends you want to share in the ceremony with you on your big day. A lot of couples send sweet letters or little gifts as a way to ask people to be a part of your wedding party. Get creative and have fun! We would highly suggest this. An event planner attends to every detail of the event planning process. They help you stay on budget and on schedule for your big day. They will be able to think of event planning details that you didn’t even consider and ensure your wedding day is perfect. 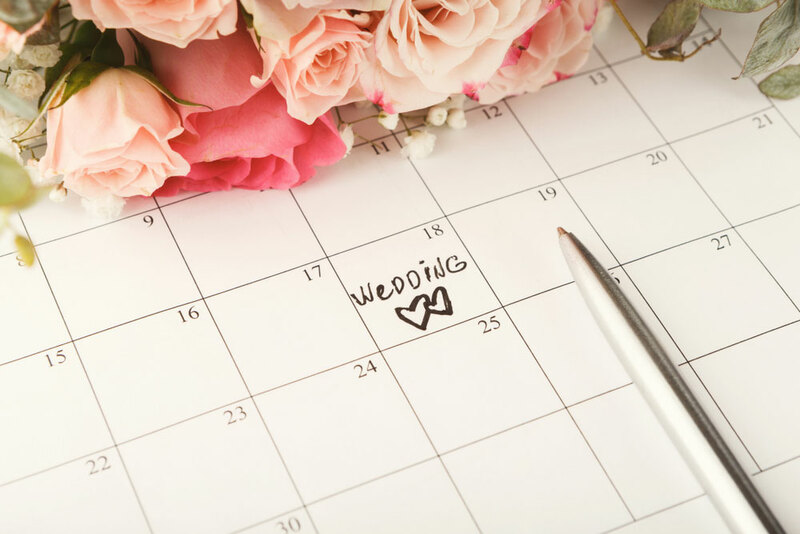 If you have a specific venue that your heart is set on, you might have to plan in advance and be a little bit flexible with your schedule. If you have a particular date you are set on for your big day, you may have to choose a venue according to what is available on that date. Plan ahead and choose the perfect place that’s right for you. When choosing a photographer and videographer, make sure to review their portfolio of work to make sure that they have the style you want for your wedding. Meet with them and talk about your vision to make sure your wedding memories will be perfectly preserved! You’ll need to make choices about florists, caterers, entertainment, and more. Like with the photographer, you need to make sure you thoroughly vet each individual vendor to make sure that everyone is on the same page. An event planner can be a big help with this process, leveraging their experience and reputation to get quality services at reasonable prices, so you get the best value from your vendors. Make sure to book an officiant well in advance, so he or she has plenty of time to prepare what they’re going to say for your wedding ceremony. You should also arrange for their lodging if they are traveling to be at your wedding. If you have personal vows, let your officiant know ahead of time, so when you say “I do” it will be the perfect moment you imagined! This is one of the most fun parts of planning your wedding. Your dress should be a reflection of your personality and inner beauty. You should feel elegant and comfortable on your wedding day, so choose the dress that feels just right! Your wedding invitations will be a fun part of the overall theme of your wedding. Choose a style that speaks to you, and a personal message announcing your special day. Make sure you send out your invitations about 2 months before the wedding, so people have plenty of time to RSVP! Don’t forget this step! If you want to be legally wed, you need to go down to the courthouse and get your marriage license. This is the most important step! Just remember that even if surprises come up, at the end of the day you will be married to the person you love. Enjoy the experience and focus on your happy future together! Let The Alleen Company Help With Event Planning! If you need some help with event planning, make sure to contact us at The Alleen Company. We would love to help you plan the wedding day you’ve always dreamed about! Let us help you create special memories that will last for a lifetime of love!